With high water levels at Bungsamran Lake in Bangkok giving the best chance for fishing for Giant Siamese Carp. Min fished a short six hour session and caught several Mekong Catfish with weights to an estimated 30kg’s. After a quiet spell lasting almost an hour Min’s hook bait was picked up by his intended species. Instantly the carp charged towards the snags almost making it into the sanctuary of the wooden supports. 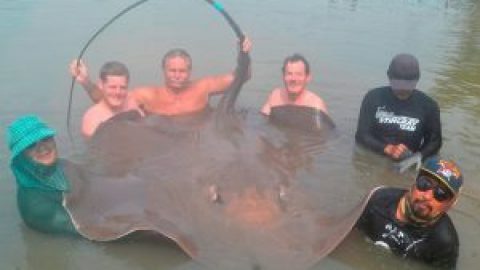 Expertly, the fish was played out into open water where it continued to make massive boils appear on the surface it would be twenty more minutes before the fish was safely netted. 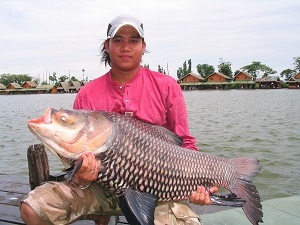 The Giant Siamese Carp was found to have an extremely large girth and was estimated to weigh 30kg’s. It would only be fifteen minutes later when another carp would again pick up Min’s buoyant hookbait. Once again the fish would charge into the snags this time briefly entering them. Heaving with all his might Min managed to once again regain control and the fish was quickly netted by Jeab.